Artificial Cave shelters are underground shelters constructed by digging tunnels into the earth. The basic design focused on in this book was developed during the First World War and is a highly developed practical battlefield tested design. The design was relatively easy to construct with material on hand because it requires only wood and did not generally involve the use of concrete or steel. While it did require a certain amount of skill and practice to construct, the instructions in this book were designed to instruct people who have little or no experience in the subject. The shelter is of a modular design that could be built in many different ways using the "building blocks" supplied in the design and could be expanded indefinitely. Also it is interesting how it could even now offer a high degree of protection against many modern weapons despite the age of the design. Our third edition now expands our popular Artificial Cave Shelter book with forty pages of new documents. This book is a companion book to our other books: "Bunker Design" and "Bunker Design Collection", which focus on cut and cover protected shelters. 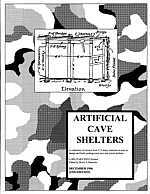 The information in "Artificial Cave Shelters" is self contained and requires no other book to understand the information in it. This book is divided into seven sections, plus two appendixes, and documents the sources of information and details artificial cave design and construction. It details tunneling technique, material standards, special tools, the influence of underground water, ventilation and even gas proofing. 1. This book is a companion book to: Bunker Design (which is concerned with the design of cut and cover bunkers) and Bunker Design Collection (which gives designs of various types of historical bunkers). We just couldn't put it all in one volume.